"I will discover the power of Crystania and make it my own!" 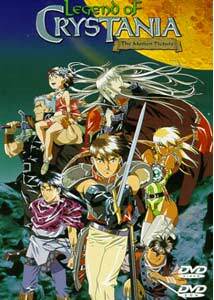 Legend of Crystania: The Motion Picture is the thematic follow-up to the lengthy Japanese series Record of Lodoss War. Both were authored by Ryo Mizuno, an extremely popular author of fantasy in Japan, considered to be the Asian equivalent of J.R.R. Tolkien or Piers Anthony. Having seen the entire Lodoss Wars series, I honestly didn't think this would be a good thing. Despite the classic status of Lodoss, I found it to be an extremely dull experience; an elaborate fantasy story that took far too long to get going, then ended just when the pace picked up. Legend of Crystania, which takes place sometime after that period, is a much different type of film. It's shorter, obviously, then a 10-12 hour series, and it moves along extremely fast. Knowledge of Lodoss Wars is unnecessary to follow Crystania; the connections are extremely minor. As Crystania begins, Lord Ashram and his elven assistant Pirotesse (the only characters from Lodoss) are searching the globe for a place where their displaced people may live. They come upon God's Wall, a mystical place where a huge, serpent-skin wall separates mankind from the land of Crystania, where the gods live. Ashram demands that the gods take in his people, and the voice that answers his plea promises him a new kingdom and powers so long as he gives up his body. Foolishly, Ashram agrees, and he and his army are allowed to enter Crystania. Many years later, we meet Redon, whose father is a benevolent Lord; ruler of a peaceful and healthy land. Unfortunately, government unrest in the land of mortals leads the Royal Army to come to his quiet town to stir up trouble. They assassinate the Lord, and try to kill off his family and supporters. Redon and all his friends must flee, and in the process, they come to God's Wall where a mysterious voice promises Redon power if he will enter Crystania. He and his friends enter, despite the dubious nature of this voice, and instead of finding a dreamlike paradise the gods control, they find a land in complete turmoil. The various tribes of Crystania are at war with each other because Barbas, king of all gods, is now trying to take over this paradise for himself. He has grown in strengthbecause he has taken over the human body of Ashram. Redon and his friends get involvedin this confusing civil war and are taken in by a tribe of people that can transform intoLions and other beasts. Their enemies are Lizards and Tigers, the tribes that have sidedwith Barbas. Redon discovers that Pirotesse (now known as Sheru) holds the key topossibly releasing Barbas from Ashram's body: the Chaos Ring. To put it simply, if you're a fan of dark fantasy, you'll probably like Crystania: The Movie. It's been awhile since I've read or watched anything of this sort that really amazed me with its creativity and energy, and Crystania is worthy of praise for managing to create an exciting and visually interesting story in a time when fantasy tales are almost a dime a dozen. It's old-fashioned swords-and-sorcery that emphasizes action over heavy character development on the screen. For some, the vague nature of the characters here might be a flaw, but for me, it was a refreshing change of pace from Lodoss War, which was almost nothing but development. To be honest, I wonder why author Ryo Mizuno even bothered using Lord Ashram and Pirotesse as characters, when they could have easily been completely original characters. Although the extreme violence keeps this program in a more adult realm, it still has an element of classic storytelling one might find in the best children's fantasy novels. Despite being only about 80 minutes long, there's a lot packed into the running time, and there's certainly a lot of ideas worth building on, which probably explains the Crystania limited anime series that emerged afterwards. This is an epic in half the time, really, and it's the impressive talent of the filmmakers that breaks down the story so well without losing its adventurous nature. Image Transfer Review: The image seems to suffer from some source problems that weaken its overall quality. For the most part, the transfer is steady, although the animation is traditionally-made, so that it looks much older than it is. The major issue comes from a severe over-sharpening problem; major ringing and artifacts appear next to sharp lines, mainly in bright scenes. From the looks of it, this ringing problem is originated in the source, not the actual disc. It's distracting and weakens the impression of the artwork, but it is not a major problem that ruins the whole show. Otherwise, the disc is free of compression artifacts or any heavy pixelization. Audio Transfer Review: The sound mix is Dolby 2.0 Surround, without any significant surround activity. The front soundstage is made well, with stereo and directional effects used quite a bit. It isn't going to blow anyone away, but on the same token, there are no problems with it and the dialogue is perfectly clear and normalized. There is good bass in many of the more elaborate action sequences. It's satisfying, but nothing special. The English dub retains the same quality, but the voice acting really doesn't work, in my opinion. I guess it's the curse of most dubs. Oddly, there are no credits whatsoever for the Japanese cast. Crystania: The Motion Picture is a good choice if you're looking for a storied, fantasy epic. It's easy to get into and doesn't require a massive amount of time to watch, so it makes a quick and excellent ride.